About ICARVISIONS (Shenzhen) Technology Co., Ltd..
ICARVISIONS is a solutions-based, global leader specializing in Telematics hardware and software design, manufacturer and deployment of Mobile Digital Video Recorders(MDVR) and Sensors, Cameras, Cables and Accessories. ICARVISIONS was established in Shenzhen, China by a group of software and hardware engineers who have specialized in video and participatory development for years with one goal in mind: marketize and popularize the industrial grade DVR system with cloud system integrated with big data and deliver visual insights into fleet behaviour/safety. 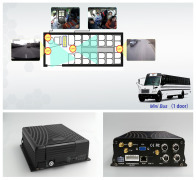 we offer you different Mobile-DVR solutions depends on your company models or fleet sizes. As an R&D company, we are also more than welcome for any customization requirements(OEM). Why you have to choose our MDVR but not common mobile DVR from the marketing? FOR MORE INFORMATION CONTACT ICARVISIONS (SHENZHEN) TECHNOLOGY CO., LTD.